75 to 90 Minute Fire Rated Gun Safes Provide Weapon Security for Applications Including Commercial, Residential, Security, and more. 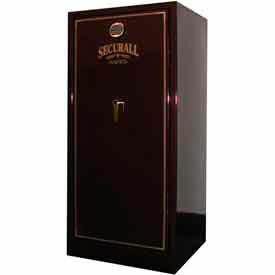 75 to 90 minute fire rated gun safes are made of steel for strength and durability. Safes ensure vandalism, theft, and fire protection for handguns, rifles, ammunition, and more. Easily programmable, five button mechanical lock provides firearm security and access. Quick release mounting brackets secure safe to desks and shelves. Anti-pry bracket provides additional theft security. Felt lined tray prevents interior content damage. Lock types are Combination Lock, Electronic Keypad Lock, and Mechanical Combination Lock/Electronic Keypad Lock. Fire ratings are 75 Min. @ 1400°F, 90 Min. @ 1200°F, and 90 Min. @ 1200°F. Capacities range from Up to 24 Guns to Up to 69 Guns. Color finishes are Gray Pebble, Gun Metal Gray, Gun Metal Gray Gloss, Hammertone Black, and Silver Gray. Dimensions vary per model. 1-Hour Fire Rated Gun Safes Provide Firearm Security For Residential, Retail, Security, and Other Applications. 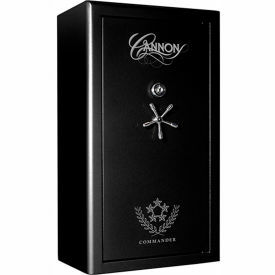 These 1-hour fire rated gun safes are designed to provide fire and theft protection for handguns, rifles, ammunition, and more. The electronic keypad allows you to easily customize the key code for unauthorized access prevention. The safes are made of steel for long lasting strength, durability, and impact resistance. The pry-resistant door and steel lock bolts prevent forced entry for added theft protection. 30 to 45 Minute Fire Rated Gun Safes Provide Weapon Security for Applications Including Commercial, Residential, Security, and more. 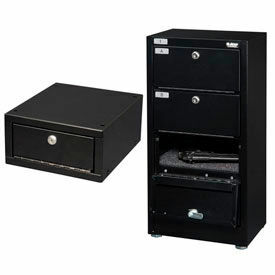 30 to 45 minute fire rated gun safes are made of steel for strength and durability. Safes ensure theft and fire protection for handguns, rifles, ammunition, and more. Adjustable shelves allow content size versatility. Optional roller bearing mount turret available on select models. Available types are Combination Lock, Electronic Keypad Lock, and Mechanical Dial Lock. Capacities range from Up to 12 Guns (10 Long/2 Hand) to Up to 90 Guns. Colors are Black, Black Matte, Flat Black, Gray, Green Matte, Hammered Gun Metal Gray, Hammertone Black, Hammertone Brown, and more. Dimensions vary per model. Barska® Extra Large Biometric Gun Safe Storage Cabinets Are Used For The Secure Storage Of Rifles And Other Sensitive Equipment. Barska® Extra Large Biometric Gun Safe Storage Cabinets are made of heavy duty steel for long lasting durability. Features biometric fingerprint technology with storage of up to 120 identities for enhanced reliability. Five point deadbolt locking system for added safety. 16 position internal storage rack and door are removable for increased versatility. Interior liner provides added protection for priceless valuables. 1 or 3 removable shelves for ease of use. Can be mounted to wall, floor or any solid flat surface. Includes mounting hardware. 2 coded keys offer secondary access point. Silent access mode. Operates with (4) AA batteries(included). Assembled. Color is Black. Available in 4, 12 or 16 gun capacities. Dimensions vary per model. 1 Year Limited Warranty. Security Gun Cabinets Provide Gun Safety And Protection For Applications Including Residential, Commercial, Storage And More. 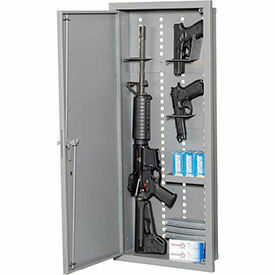 Security gun cabinets are made of steel for long lasting durability and dependability. Four point tubular locking system includes two individually coded keys for added security. Lock types are Electronic Combination Lock, Keyed Lock, Keyed Lock/Keyed Alike and Tubular Keyed Lock. Gun capacities range from 5 to 24. Colors are Ag Green, Beige, Black, Black Matte, Black Hammertone, Blue, Gray, Green, Md Green, Hunter Green Matte, Red and more. Dimensions vary per model. Steel Rifle And Shotgun Safes Provide Storage And Security For Firearms In Residential Or Commercial Environments. 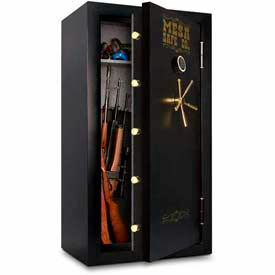 Steel Rifle and Shotgun Safes are made of all-welded steel construction for long lasting durability. Horizontal or vertical mounting provides easy out of the way storage. Five push button mechanical lock provides quick and easy access to firearms. Combination lock is easily set and changed allowing up to 1081 possible codes. Case is lined with foam and includes a Self Adhesive strap to provide added security for firearm. Two tumbler locks with keys are located in each corner of safe for added security. 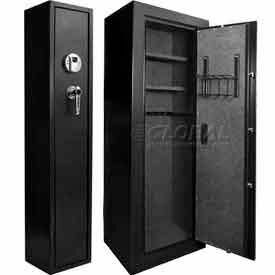 Available types are Shot Gun Safe and Rifle Safe both safes hold 1 gun. Dimensions available are 8"Wx3-1/2"Dx42"H and 12"Wx3-1/2"Dx42"H. Color finish is Semi Flat Black. Get more storage space and take up less floor space with this 10-Gun Corner Cabinet. 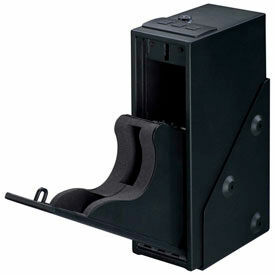 It easily mounts in any corner and has five storage shelves for holding all types of shooting accessories. It features the industry's toughest finish, a powder-coated epoxy to brush off nicks, dings and scratches. Four-point locking system with premium-grade lock and two keys. Recessed Gun Storage Cabinets Provide Semi-Concealed In Wall Storage For Gun Collections. 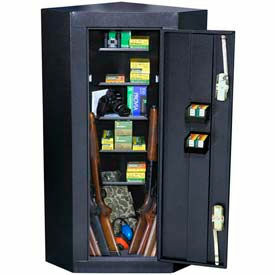 Recessed Gun Storage Cabinets are made of steel to provide long lasting durability. Semi-concealed in-wall storage unit has interchangeable components to customize unit. In wall, recessed design saves floor space and can fit between and be anchored into wall studs for added security. Shelves and other components are available for general or customized storage. Full height piano hinged door prevents tampering to provide added security. Large selection of gun capacities to meet specific firearm storage needs. Lock types are Keyed Lock/Keyed Different, Kaba Simplex Combo or Electronic Keypad. Color finishes include Battleship Gray, Desert Sand, Ivory and Stealth. Accessories to increase pistol storage capacity are sold separately. Datum ArgosCABINET™ Gun Storage Cabinets Provide Security And Theft Prevention For Law Enforcement, Retail, Residential And More. 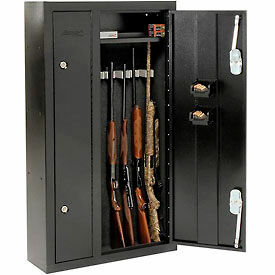 Datum ArgosCABINET™ gun storage cabinets are made of steel for long lasting durability and dependability. Ventilated doors permit airflow and inventory visibility. Keyed lock secures cabinets with padlock option for added security. Locking variations comply with U.S. military standards. Adjustable shelves available. Gun capacities range up to 24 Rifles/40 Pistols. Lock types are Keyed Lock, Keyed Alike. Available colors are Battleship Gray, Desert Sand and Stealth. Dimensions vary per model. 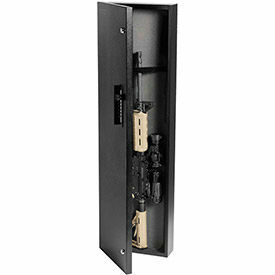 Datum ArgosRACK™ Gun Open Racks Are Widely Used In Secured Environments Such As Supervised Areas Or Controlled Vaults. 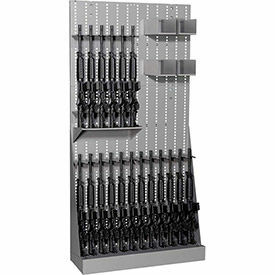 Datum ArgosRACK™ Gun Open Racks are made of steel for long lasting durability. 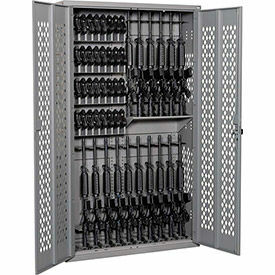 Rack includes components for storing up to 18 or 24 Rifles with bins for ammo and other accessories. Overall size is 42"Wx15"Dx83"H. Components to house pistols, ammunition, rifles, heavy weapons, and even tactical gear can be utilized for customization (sold separately). Some gun racks include 2 adjustable shelves. Color finishes include Battleship Gray, Desert Sand and Stealth. Datun Argus Pistol Security Cabinets Keep Pistols And Other Firearms Safe And Secure. Datum Argos Pistol Safes are made of steel to provide long lasting durability and maximum protection for pistols. Available styles are Single Tier, 4- and 6-Tier. Foam insert included to protect stored items. Capacities are 2, 8 and 12 pistols. Lock types are Hasp (padlock not included) and Key Lock/Keyed Different. Gun safes must be wall mounted for structural safety. Available color finishes are Battleship Gray, Desert Sand and Stealth. Dimensions vary per model. Pistol Boxes With Easy Access Drop Door Are Used For Storing And Securing Small Valuables Or Handguns. Pistol Boxes are made of wear and tear resistant powdered steel for long lasting durability. Keyless fast-access code restricts unauthorized access to guns and valuables, but is quickly and easily accessible to authorized user. Easily mounted inside a closet or a drawer. With cubic feet capacities of 0.12, 0.26 and 0.63. Available in Black. Dimensions vary per model. 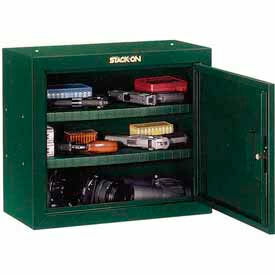 Stack-On™ Pistol Security Cabinets Secure And Store Pistols, Ammo, Supplies And Valuables. Stack-On™ Pistol Security Cabinets feature a locking mechanism through a steel door behind a steel door frame for added security and long lasting durability. Epoxy paint finish with silver accents provides a moisture- and solvent-resistant finish. Units are fully lockable with key coded, double-bitted lock. Pre-drilled mounting holes allow for easy attachment to the floor, ceiling, wall or pre-assembled gun cabinets. Foam-padded bottom. Meets California Penal Code Section 12088 requirements for California DOJ-approved firearms safety devices. Fastening hardware included. Available in 1-Shelf and 2-Shelf sizes in Green or Black. Compact Pistol Safe Boxes Ensure Content Protection For Travel, Law Enforcement, Military, and Other Applications. 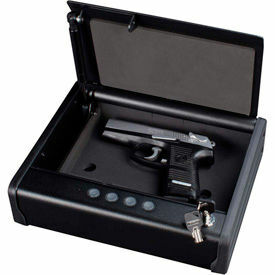 These compact pistol safe boxes provide portable security for weapons, jewelry, sensitive documents, and other items. The boxes are made of steel making them strong and impact resistant for lasting reliability. The compact design allows the boxes to be stored in brief cases, under seats, in luggage, or other small areas. Includes a foam interior for added content protection. Multiple lock types are available. Quick Access Pistol Safes Provide Weapon Access And Security For Applications Including Residential, Office, Commercial And More. 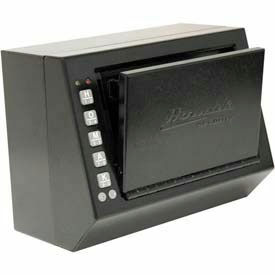 Quick access pistol safes are made of steel for long lasting durability and dependability. Safes allow immediate weapon access and concealed storage security. When unlocked, the spring-loaded door swings down with pistol in the ready position. Foam padded interior offers handgun protection and magazine storage. Conveniently mounts to wall, bedframe, nightstand or other locations. Includes a pushbutton electronic lock that accepts a personalized 3 - 8 digit security code. Features a low battery warning system, 2 back-up keys and mounting hardware. Accommodates most handguns. Lock types are Biometric Fingerprint Lock and Electronic Keypad Lock. Package quantity is 1. Color finish is Matte Black. California DOJ Firearm Safety Device listed. Dimensions are 4-3/16"W x 7-7/8"D x 14-3/8"H.